Lightly grease 13 x 9 baking dish. Prepare rice a roni to package directions, when rice is tender spread rice in an even layer in bottom of baking dish. Combine cumin, cayenne, chili powder, garlic powder, salt and pepper in a small bowl and mix well. Sprinkle seasoning on both sides of pork chops. Brown pork chops in 1 tbsp olive oil skillet over medium heat until just lightly browned on both sides and then place chops on rice in dish. Slice bell peppers and onion into rings and saute in 1-2 tbsp olive oil in skillet over medium heat 5-10 minutes until tender. 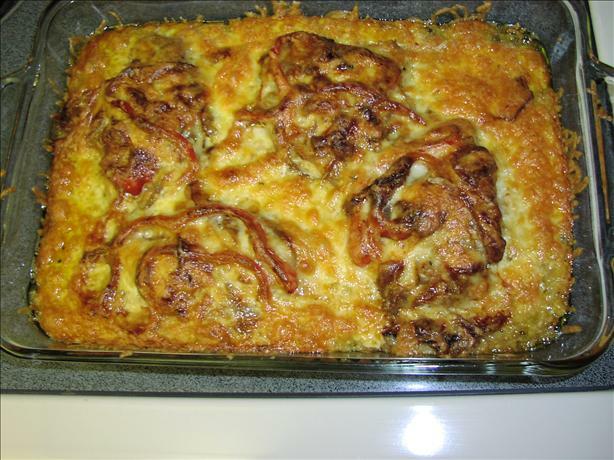 Place sauted onion and peppers over pork chops. Top dish with grated pepper jack cheese. Bake uncovered 30 minutes until pork chops are cooked through and cheese is browned and bubbly.